"The medium is the message" - Marshall McLuhan. Perhaps what Marsh was saying was that what is produced is determined and affected by the media used to deliver it in a symbiotic relationship; so we may unconsciously change things for that medium to change people’s perception. Well, not sure that's what we have here. This is a great band soulfully and funkily nailing Hayes tunes and 3 covers, stretching out to show their expertise and often keeping the swagger intact. The double CD is often sublime. The DVD is a good visual document. There are no bells and nary a whistle here. The band are given plenty of room to set up, resembling a soulful show band, horn section and all, whilst the stage only has ruched curtains hanging at the back to stand for any scenic design. They were probably there anyway. The lighting is sultry red, cold blues and the general wash you'd expect. 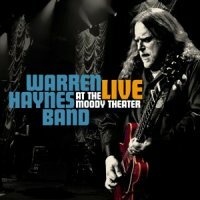 There are many close ups of the band and it's a positive boon to see Warren's flying fingers as he teases outrageous notes from his guitar. The audience aren't really shown at all, throwing the focus on the music but leaving a slightly sterile atmosphere, although there are some interesting shots of the back of players' heads. So there is no “show”. This is all tell. The band is static and so is Warren. They are all lost in the music, even beautiful buxom backing singer Alicia Chakour who at least essays a sway or two. And as this is about the music, you may ask why you'd need a DVD when the CD is available? Valid question. Well, they come together in a rather lovely digipack, containing a nice booklet with good info and photos of Warren smiling and playing. Which in general is what he does. But as for the spectacle, bangs and crashes are there none. Ian MacLagen, (erstwhile Faces/Small Faces/Stones) is a well preserved and perky guest, but that's the only real distraction. Of the tracks on offer, ‘Invisible’ is a great funky jam. Whilst Ian McLagen adds to the simple strut of ‘Take A Bullet’ and ‘On A Real Lonely Night’ adds so much, including elements of Country, Steely, an excellent organ solo, a doubled sax spot, a smoothness that’s the envy of the West Coast and Warren’s ever-present pristine guitar; it’s the best thing here. The encores are a version of ‘Hattiesberg Hustle’ and a rather fetching acoustic version of ‘Patchwork Quilt’ but hardly worth jangling your coins for. 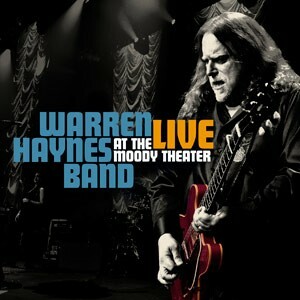 Warren isn't aiming for new blood though, as the fans he's got already will love seeing his fabulous band in action. And there's nothing wrong with that. You might just need someone to pinch you every half an hour, that's all.